Retractable Awnings: Manual or Motorized? Which kind of retractable awning is right for you? You know you want a retractable awning. Their versatility is unmatched, they look positively classy covering your patio, and you can’t wait to take control of your outdoor experience. Once you choose your style, there’s one more decision to make. 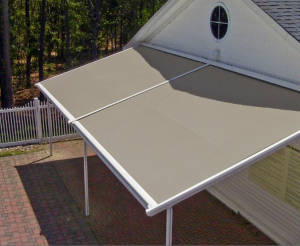 In most cases, you can choose whether you want a motorized or manual retractable awning. In both cases, you’ll get the exciting benefits of a retractable awning, but your experience may vary a bit. Check out the pros and cons, and decide which type suits your lifestyle best. With a manual retractable awning, you, a family member, or a guest will manually turn a crank or handle to let out your awning, or draw it back in. This process may seem a bit rigorous and potentially exhausting. The truth is, while it does take more time than a motorized awning, modern technology makes it a very simple and easy process. It doesn’t take much strength to get the job done at all. Your child could probably handle the task with ease. When using manual retractable awnings, you’ll never have to worry about mechanical problems, and maintenance is often comparably minimal. They are easy to install, and the vertical rods used provide greater stability. Additionally, if your power goes out, your awning will still be completely usable and can even help keep you cool if your air conditioning goes out. Motorized retractable awnings are a breeze to use. They are unfurled through the power of an electric motor, and the process is very quick and easy. You’ll barely need to lift a finger, and you can change your mind on a dime. This process occurs through the use of telescoping arms, giving the entire awning a very modern look that is definitely a bit different from a manual retractable awning. If this look matches your home better, this may be the awning style for you. One of the most exciting elements of a motorized retractable awning is that it can be programmed to open and close automatically thanks to wind and sun sensors. This feature can help you control your energy bills, and can save your awning from damage at the hands of wind.